Cancer Survivor Ann-Marie Turns to the Botched Docs After a Traumatic Double Mastectomy: "It Smelled Like Death"
The Botched doctors are righting these medical wrongs. 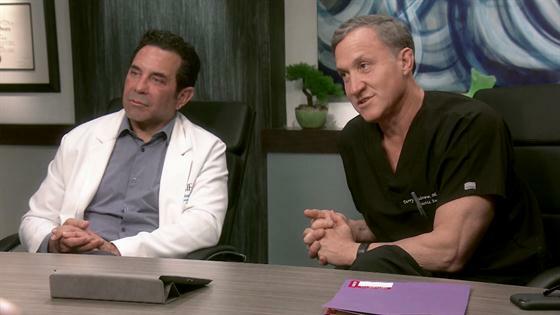 On Wednesday's all-new episode, doctors Terry Dubrow and Paul Nassif met with two new patients who each felt frustrated following messy plastic surgeries. First up, 46-year-old Ann-Marie learned she had breast cancer not long after relocating to South Carolina. In an attempt to combat the cancer, Ann-Marie's doctors at the time performed a double mastectomy and the DIEP flap procedure for reconstructive purposes. However, after bruising and necrosis formed on her body, another doctor pondered if an intern actually performed the procedure. "Afterwards, he instructed me to stuff the holes with saline soaked gauze," the Charleston resident revealed. "There were times that I would just tremble 'cause it smelled like death. It tore me apart, it really did." Thus, she hoped Dr. Dubrow would be able to right some of the damage done to her body. Although Ann-Marie's husband John loved her as is, he hoped a revision surgery would help his wife smile again. "I don't know if you can get rid of all the scarring because there's so much scarring," Ann-Marie informed the doctors. "And there's a part of me that kind of has accepted that, but I want to not look in the mirror and cringe." Upon examining Ann-Marie's situation, Dr. Dubrow ruled that the new patient needed a "very significant operation on the breast" and had to "completely redo the tummy tuck portion." Despite the difficulties surrounding the case, Heather Dubrow's husband agreed to help Ann-Marie. Even though "this was an extraordinarily difficult operation," Dr. Dubrow left the operating room feeling "really, really happy" about his work. And he wasn't the only one as Ann-Marie couldn't contain her joy following her visit to the O.R. "Now, after surgery, I no longer look like a monster," Ann-Marie gushed to the Botched camera. "Those scars are gone. I am happy with what I see and I don't mind if John catches a peek, either." Ann-Marie wasn't the only happy patient as psychic Danielle also had a successful encounter with the Botched doctors. Danielle's Breast Implants Capsulized Twice--And She's Had It! According to the clairvoyant, she decided to remove her implants after two botched surgeries resulted in capsulized breasts. "Having breast implants that are literally almost into your armpits and completely being squeezed by capsulized scar tissue is the most uncomfortable experience," the medium mom explained in a confessional. Following the presentation of Danielle's case, the doctors seemed eager to help her get back to her natural breasts. "Sometimes it's better to take breast implants out, especially in cases like Danielle, who's had a lot of complications up to this point!" Dr. Nassif expressed later on. "Breast implants are not for everyone." Unsurprisingly, after removing the silicone implants, Dubrow was able to give the natural look the new patient hoped for. In fact, a post-surgery Danielle boasted that she was "a brand new me." See everything that went down on this week's episode, including plastic surgery enthusiast Laura's $450,000 journey, in the recap video above!